FSGS is a CKD with heavy proteinuria that eventually progresses to ESRD. Hereditary forms of FSGS have been linked to mutations in the transient receptor potential cation channel, subfamily C, member 6 (TRPC6) gene encoding a nonselective cation channel. Most of these TRPC6 mutations cause a gain-of-function phenotype, leading to calcium–triggered podocyte cell death, but the underlying molecular mechanisms are unclear. We studied the molecular effect of disease-related mutations using tridimensional in silico modeling of tetrameric TRPC6. Our results indicated that G757 is localized in a domain forming a TRPC6-TRPC6 interface and predicted that the amino acid exchange G757D causes local steric hindrance and disruption of the channel complex. Notably, functional characterization of model interface domain mutants suggested a loss-of-function phenotype. We then characterized 19 human FSGS–related TRPC6 mutations, the majority of which caused gain-of-function mutations. However, five mutations (N125S, L395A, G757D, L780P, and R895L) caused a loss-of-function phenotype. Coexpression of wild-type TRPC6 and TRPC6 G757D, mimicking heterozygosity observed in patients, revealed a dominant negative effect of TRPC6 G757D. Our comprehensive analysis of human disease–causing TRPC6 mutations reveals loss of TRPC6 function as an additional concept of hereditary FSGS and provides molecular insights into the mechanism responsible for the loss-of-function phenotype of TRPC6 G757D in humans. FSGS is an important cause of ESRD in children and adults, presenting in most patients as steroid–resistant nephrotic syndrome (SRNS).1–4 Although the cause of primary FSGS is yet unclear, histologic analyses show that impaired podocyte function and loss of podocytes are hallmarks of FSGS. Analyses of secondary genetic forms of FSGS enabled the identification of genes involved in this pathologic entity.5 The spectrum of disease genes ranges from proteins involved in the slit diaphragm architecture to signal transduction and cytoskeletal proteins. Mutations in transient receptor potential cation channel, subfamily C, member 6 (TRPC6) have been identified to cause FSGS in patients with adolescent-onset proteinuria.6,7 TRPC6 constitutes a nonselective cation channel of the classic subfamily of TRPC.8,9 TRPCs mediate calcium entry on hormonal stimulation via phospholipase C and subsequent breakdown of phosphatidylinositides, with generation of diacylglycerol directly activating TRPC6.10 In the kidney, TRPC6 is detected along the glomerulus and the collecting duct.11 TRPC6 colocalizes and physically interacts with podocin, a protein of the slit diaphragm integrated in podocyte signaling complexes.12 After description of six TRPC6 mutations in patients with FSGS (P112Q, N143S, S270T, K874*, R895C, and E897K),6,7 additional disease–causing mutations in the human TRPC6 gene have been reported (P15S13; N110H14; G109S, N125S, and L780P15; M132T16; R175Q17; R360H18; L395A and A404V19; Q889K20; 85_88dupAYMF and G757D21; and H218L and R895L22). Altogether, 21 disease-causing mutations have been identified to date. Functional studies of TRPC6 mutant cDNAs in heterologous expressions systems showed the gain-of-function (GOF) phenotype of the mutated protein leading to increased calcium entry compared with wild-type (WT) TRPC6.6,7,16,20,22 Increased calcium load of podocytes caused by the GOF phenotype of TRPC6 mutants is believed to be responsible for podocyte cell death and FSGS. Although the mechanisms leading to renal failure are, therefore, at least partially understood, the molecular mechanisms responsible for changed channel activity by disease–causing TRPC6 mutations remain largely unclear. Here, we report our results of an in silico approach to study mutation–induced molecular changes of the tetrameric protein structure of TRPC6. 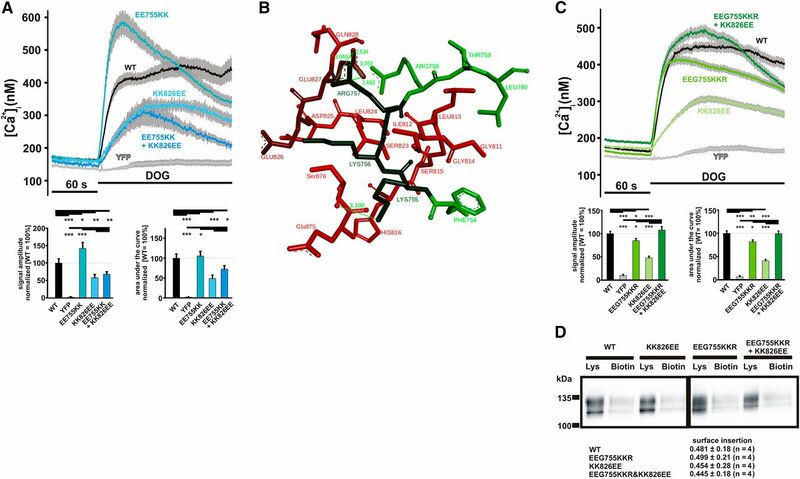 Subsequent functional studies of delineated mutants led to the identification of loss-of-function (LOF) phenotype mutations within the TRPC6 protein structure. Comparable features were found for the disease–causing mutation G757D, which together with its dominant negative character, provides evidence for the disease-causing potential of reduced TRPC6–mediated calcium entry. The molecular effect of FSGS–related amino acid exchanges within TRPC6 was studied using a tridimensional (3D) model. As described in Concise Methods, we generated a model of the TRPC6 ion channel (Figure 1A). The side view shows the bell–shaped swollen structure (Figure 1B) as previously described for other transient receptor potential cation channel (TRP) channels.23–25 We analyzed the positions of known FSGS–related TRPC6 amino acid exchanges. Most of the positions were located on the protein surface, thus preventing the formulation of hypotheses to study structure-function relationships. Solely TRPC6 G757D21 was located inside the protein complex (Figure 1C). The model provides evidence that amino acids 754–760 of the TRPC6 protein (Figure 1C, green) form a loop structure gripped and embedded by helical structures formed by amino acids 811–830 of the adjacent TRPC6 molecule (Figure 1C, red). The exchange of glycine 757 (Figure 1D) to aspartate (Figure 1E) within the loop structure is in conflict with isoleucine 812 of the helical structure and hampers a compact structure because of changes in size and charge of the residue. Tridimensional in silico modeling of tetrameric TRPC6 identified C-terminal TRPC6-TRPC6 interaction domain. Because of the lack of data on the TRPC6 structure, we generated a model of the TRPC6 ion channel as described in Concise Methods. On the basis of different approaches, it is well accepted that TRP channel complexes represent a homotetrameric complex with the ion-permeable pore in the center of the protein complex. The tetrameric structure is visualized by using different colors for each subunit (chains 1–4). (A) View from the extracellular side. The four monomeric TRPC6 proteins forming the ion channel complex are colored differently: red (chain 1), light blue (chain 2), yellow (chain 3), and green (chain 4). In the middle, the four monomers form a clearly visible central ion channel pore, which illustrates that TRPC6 is evolved as a sensor for different signals and not only as simple ion–conducting pores. (B) Full homology model viewed parallel to the membrane. The membrane is displayed with blue and red sticks, which illustrate the properties of the atom. (C) Model viewed parallel to the membrane without ankyrin domains to enable visibility of the region of interest. The atoms of the considered mutation region are visualized with bold sticks. The chosen colors correspond to those in A. The region of interest is encompassed by the N–terminal ankyrin repeat structures, which were removed for visualization of G757D. Additionally, the region of interest is zoomed out, showing that the mutated amino acid is located in a green loop region (chain 4) and makes contact with red short helical structures (chain 1). Detailed views of the region of interest with (D) the WT amino acid sequence and (E) the mutant. For a better viewing of the mutation site, these figures are rotated by 90° clockwise. The model provides evidence that, in human TRPC6, the amino acids 754–760 of the TRPC6 protein (chain 4 in green) form a loop structure gripped and embedded by helical structures formed by amino acids 811–830 of the adjacent TRPC6 molecule (chain 1 in red). On the basis of this model, the exchange of (D) glycine 757 to (E) aspartate within the loop structure is in conflict with isoleucine 812 of the helical structure and hampers a compact structure because of changes in size and charge of the residue. (F) The human TRPC6 sequence (amino acids 751–830) is compared with the corresponding protein sequences of TRPC6 from Callithrix jacchus, Sus scrofa, Bos taurus, Equus caballus, Ovis aries, Canis lupus, Rattus norvegicus, Mus musculus, Jaculus jaculus, Mesocricetus auratus, Sorex araneus, and Heterocephalus glaber. The domain with a hydrophobic character on the basis of the high content of hydrophobic amino acid residues (marked by blue background) is interrupted by duplicates of charged amino acids (yellow boxes; purple background indicates negatively charged amino acids, and red background indicates positively charged amino acids). The glutamine doublet (EE755/756) before glycine 757 in chain 1 (green in D) and the lysine doublet (KK826/827) vis-à-vis glycine 757 in chain 2 (red in D) gave rise to the approach enabling validation of the model. Multiple sequence alignment (Figure 1F) showing a highly conserved structure across the species gave rise for an approach to exchange negatively with positively charged amino acids (TRPC6 EE755/756KK) and vice versa (TRPC6 KK826/827EE), resulting in changed activity, whereas the combination of both mutations (TRPC6 EE755/756KK and KK826/827EE) should restore WT activity. We introduced the mutations in the TRPC6 sequence and studied the proteins’ function (Figure 2A). Compared with cells expressing WT TRPC6, cells expressing the EE755/756KK mutant showed increased calcium entry corresponding to a GOF phenotype, whereas the KK826/827EE mutant responded to stimulation with reduced responses, being in line with an LOF phenotype. 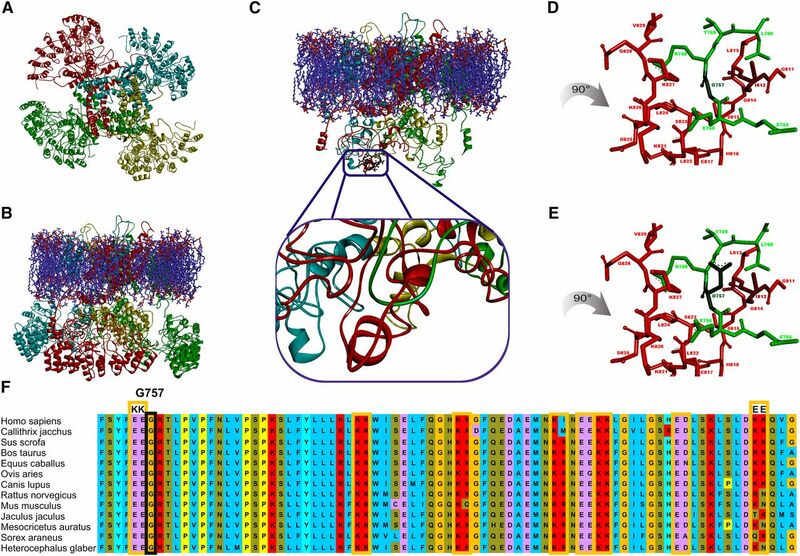 Structural analysis of EE755/756KK revealed that the GOF phenotype is on the basis of stabilizing hydrogen bonds and that the LOF phenotype of KK826/827EE is on the basis of destabilizing clashes. However, the combination of both mutations (EE755/756KK and KK826/827EE) did not result in WT activity as predicted. To achieve WT activity, we optimized our model. The replacement of glycine 757 by arginine results in the formation of a stabilizing link between arginine 757 and glutamine 827, thereby improving protein stability (Figure 2B). Surprisingly, the EEG755–757KKR mutant also showed reduced activity, consistent with an LOF phenotype (Figure 2C). The combination of both mutations (EEG755–757KKR and KK826/827EE) displayed calcium entry comparable with WT TRPC6, validating our model and supporting the hypothesis that the cytosolic TRPC6-TRPC6 interface domain modulates transmembrane transport activity of TRPC6. The possibility of false-positive effects caused by differences in membrane insertion was addressed by surface biotinylation experiments showing comparable surface localization of the mutants tested (Figure 2D). Thus, our data show that the C–terminal cytosolic domain is involved in mutual interaction in the tetrameric TRPC6 complex and that changes can largely affect TRPC6–mediated calcium entry. Characterization of model mutants validates the proposed TRPC6 model. To validate the model of TRPC6 and the role for the TRPC6-TRPC6 interaction domain, we generated and tested the mutants delineated from the sequences comparison. (A) Changes in intracellular calcium concentration were measured in fura-2–loaded HEK293 expressing WT TRPC6, TRPC6 EE755/756KK, TRPC6 KK826/827EE, TRPC6 EE755/756KK and KK826/827EE, and YFP. DOG (100 μM) was added 60 seconds after start of the measurement (details in Concise Methods). Traces of representative experiments are shown. Statistical analyses of data obtained during two independent experiments are presented as bar graphs. Data are means±SEMs of two independent experiments, representing, in total, 176 (TRPC6 WT), 164 (YFP), 159 (TRPC6 EE755/756KK), 159 (TRPC6 KK826/827EE), and 216 (TRPC6 EE755/756KK and KK826/827EE) transfected cells. (A, lower left panel) The graph shows the differences in amplitudes of the responses to DOG. (A, lower right panel) The graph shows the differences in the responses to DOG analyzing the areas under the curves. (B) Detailed view of the TRPC6 EEG755–757KKR and KK826/827EE mutant showing the stabilizing interaction between arginine 757 and glutamate 827, resulting in an overall compact structure. (C) Changes in intracellular calcium concentration were measured in fura-2–loaded HEK293 expressing WT TRPC6, TRPC6 EEG755/756KKR, TRPC6 KK826/827EE, TRPC6 EEG755/756KKR and KK826/827EE, and YFP. DOG (100 μM) was added 60 seconds after the start of the measurement. Traces of a representative experiment are shown. Statistical analyses of data obtained during at least three independent experiments are presented below as bar graphs. Data are means±SEMs of at least three independent experiments representing, in total, 365 (TRPC6 WT), 315 (TRPC6 EEG755–757KKR), 322 (TRPC6 KK826/827EE), 352 (TRPC6 EEG755–757KKR and KK826/827EE), and 370 (YFP) transfected cells. (C, lower left panel) The graph shows the differences in amplitudes of the responses to DOG. (C, lower right panel) The graph shows the differences in the responses to DOG analyzing the areas under the curves. (D) Surface biotinylation of HEK293 expressing WT TRPC6, TRPC6 EEG755–757KKR, TRPC6 KK826/827EE, and TRPC6 EEG755–757KKR and KK826/827EE C-terminally fused to YFP performed as described in Concise Methods. The proteins were analyzed by immunoblot using an anti-GFP antibody for visualization of TRPC6 in the lysates (Lys) and biotinylated (Biotin) TRPC6 in the avidin bead extracts. Shown are representative experiments of at least three experiments, and the quantification and statistical analysis of biotinylation experiments are given below. *P≤0.05; **P≤0.01; ***P≤0.001. Lack of information on the functional consequences of many disease–related TRPC6 mutations and the predicted LOF phenotype of our model mutants aroused our interest in a comprehensive study of known FSGS–related TRPC6 mutations. In a first set of experiments, we measured TRPC6 activity in response to carbachol.10 TRPC6 G109S, N110H (Figure 3A), P112Q, M132T, N143S (Figure 3B), R175Q (Figure 3C), H218L, A404V, Q889K, R895C, and E897K (Figure 3D) showed increased activity compared with WT TRPC6, consistent with a GOF phenotype. This phenotype seems to be heterogeneous, because there are differences between the mutants with respect to basal calcium concentrations (Figure 3E) and carbachol-induced amplitudes (Figure 3F). Our analysis allowed stratification of the mutations into two groups: mutations showing increased (Figure 3) and mutations showing comparable or reduced Ca2+ entry (Figure 4). Functional characterization confirmed GOF phenotype in the majority of known FSGS-related TRPC6 mutations. Changes in intracellular calcium concentration were measured in fura-2–loaded HEK293 expressing (A–D) WT TRPC6 and TRPC6 G109S or (A) TRPC6 N110H; TRPC6 P112Q, TRPC6 M132T, and (B) TRPC6 N143S; (C) TRPC6 R175Q; or TRPC6 H218L, TRPC6 A404V, TRPC6 Q889K, TRPC6 R895C, and (D) TRPC6 E897K C-terminally fused to YFP. Carbachol (Cch; 100 μM) was added 60 seconds after the start of the measurement (details are in Concise Methods). Traces of representative experiments are shown in each case. Statistical analyses of data obtained during at least three independent experiments are presented as bar graphs. Data are means±SEMs of at least three independent experiments representing, in total, 188 (G109S), 126 (N110H), 254 (P112Q), 136 (M132T), 299 (N143S), 271 (R175Q), 206 (H218L), 178 (A404V), 141 (Q889K), 100 (R895C), and 327 (E897K) transfected cells. (E) The graph shows the differences in basal calcium concentration. (F) The graph shows the differences in amplitudes of the responses on extracellular Cch application. *P≤0.05; **P≤0.01; ***P≤0.001. Functional characterization surprisingly revealed LOF phenotype in some FSGS-related TRPC6 mutations. Changes in intracellular calcium concentration were measured in fura-2–loaded HEK293 expressing (A–C) WT TRPC6 and TRPC6 85_88dupAYMF or TRPC6 N125S, TRPC6 S270T, TRPC6 R360H, and (A) TRPC6 L395A; (B) TRPC6 G757D; or TRPC6 L780P and (C) TRPC6 R895L C-terminally fused to YFP. DOG (100 μM) was added 60 seconds after the start of the measurement (details in Concise Methods). Traces of representative experiments are shown in each case. Statistical analyses of data obtained during at least three independent experiments are presented as bar graphs. Data are means±SEMs of at least three independent experiments representing, in total, 468 (85_88dupAYMF), 430 (N125S), 383 (S270T), 238 (R360H), 427 (L395A), 653 (G757D), 383 (L780P), and 270 (R895L) transfected cells. (D) The graph shows the differences in amplitudes of the responses on extracellular DOG application. (E) The graph shows the differences in the responses on extracellular DOG application analyzing the area under the curve. *P≤0.05; **P≤0.01; ***P≤0.001. In a second set of experiments, we characterized the mutants by using a direct TRPC activator, 1,2-dioctanoyl-sn-glycerol (DOG) (Figure 4), enabling us to study Ca2+ influx at an improved signal-to-noise ratio (comparison of WT with yellow fluorescent protein [YFP]); 85_88dupAYMF as well as S270T and R360H represent TRPC6 variants responding to DOG with amplitudes similar to WT TRPC6. 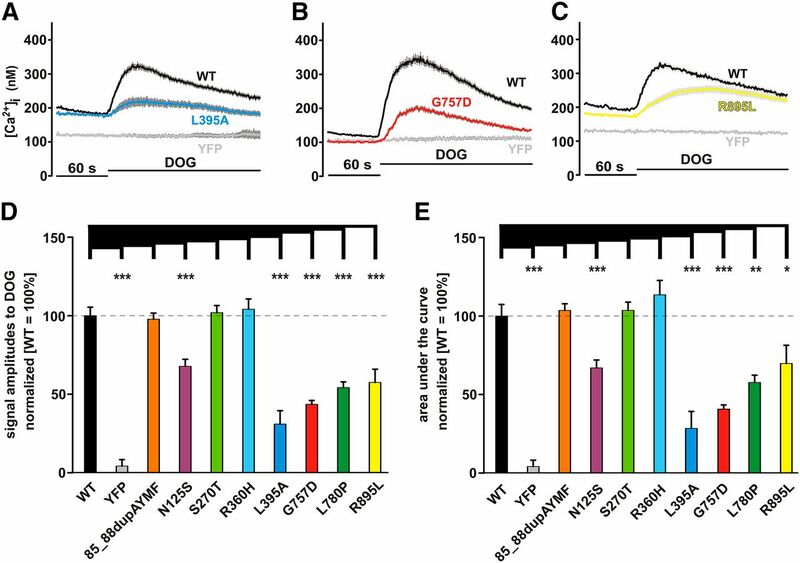 In contrast, TRPC6 N125S, L395A (Figure 4A), G757D (Figure 4B), L780P, and R895L (Figure 4C) reproducibly and significantly responded to DOG with reduced signal amplitudes arguing for an LOF phenotype of these mutants. Results are shown in Figure 4D (DOG-induced amplitudes) and Figure 4E (areas under the curve). TRPC6 L395A showed the smallest response to DOG, which nevertheless, could clearly be distinguished from the background signal generated by DOG in YFP control–transfected cells. The data indicate that some disease–related TRPC6 mutations show an LOF phenotype, with a relative rank order of preserved activity of L395A < G757D < L780P < R895L < N125S. TRPC6 G757D mutation revealed a dominant negative character. (A) The pedigree and Sanger sequence data are shown for the index patient with TRPC6 G757D. (B and C) Light microscopy ([B] periodic acid–Schiff or [C] Jones methenamine staining) of kidney biopsy of the index patient shows mesangial hypercellularity and matrix increase indicative for early FSGS. (D) The typical aspect of podocyte foot process effacement is shown by electron microscopy. (E and F) Immunohistochemical labeling of TRPC6 on (E) the normal human kidney shows TRPC6 expression considerably enhanced and clustered on (F) the index patient’s biopsy specimen. (G) Changes in intracellular calcium concentration were measured in fura-2–loaded HEK293. The cells were transfected of mixtures of WT TRPC6 C-terminally fused to CFP and YFP, TRPC6 LFW678–680AAA (LFW/AAA), and TRPC6 G757D C-terminally fused to YFP. DOG (100 μM) was added 60 seconds after the start of the measurement. The traces of a representative experiment are shown. (H) Statistical analysis of data obtained during at least three independent experiments is presented as bar graphs. Data are means±SEMs of at least three independent experiments representing, in total, 356 (WT), 169 (LFW/AAA alone), 209 (LFW/AAA:WT; 1:1), 414 (G757D:WT; 1:1), and 515 (YFP) transfected cells. Data of TRPC6 G757 shown in Figure 4E were integrated for comparison. The graph shows the differences in amplitudes of the responses on extracellular DOG application. ***P≤0.001. The dominant phenotype in the genealogy corresponding with the heterozygosity of TRPC6 raised the question on the effect of TRPC6 G757D in the channel complex composed of WT and mutant TRPC6. To mimic heterozygosity in vivo in our in vitro experiments, we studied DOG–induced Ca2+ responses in HEK293 cells expressing WT and mutant TRPC6 in a 1:1 ratio. Equimolar expression was monitored by the use of cyan fluorescent protein (CFP) and YFP fusion constructs (Supplemental Figure 1A). The results were validated in side by side experiments using TRPC6 LFW678–680AAA, a mutant with a dominant negative mutant character forming ion impermeable channel complexes.26,27 As shown in Figure 5G, cells transfected with the TRPC6 LFW678–680AAA or the WT/LFW678–680AAA DNA mixture showed no apparent changes in intracellular calcium transients, similar to YFP control–transfected cells. Cells transfected with the WT/G757D mixture responded to DOG with reduced activation. Statistical analysis (Figure 5H) revealed that cells transfected with the TRPC6 WT/G757D mixture responded to DOG with approximately 50% of the responses of WT TRPC6, which is similar to the effects of TRPC6 G757D alone (Figure 4D). The 1:1 ratio of TRPC6 WT and TRPC6 G757D ensured that, in each tetrameric complex, at least one TRPC6 G757D protein is integrated. In the case that the mutant affects only the function of one channel protein within the tetrameric channel complex, one would expect that the mixture results in amplitudes between both conditions (approximately 75%). The value of approximately 50% obtained in our experiments argues for integration of at least one TRPC6 G757D protein into the tetrameric channel complex affecting overall activity, which is in line with TRPC6 G757D being a dominant negative mutant. To substantiate the difference between WT TRPC6 and TRPC6 G757D channels, we recorded whole-cell currents in transfected HEK293 cells. In YFP (control) –transfected HEK293 cells, we tested whether the application of carbachol induces background TRP–like currents. The currents measured in control-transfected cells were negligibly small (Figure 6, A and B) and could be clearly distinguished from whole-cell currents obtained in WT TRPC6–expressing cells (Figure 6, C and D). In contrast, whole-cell currents in response to carbachol were largely reduced in TRPC6 G757D–expressing cells (Figure 6, E and F). Statistical analysis is shown in Figure 6G. Comparable results were obtained from TRPC6 L780P (Figure 7). DOG–induced current amplitudes of control-transfected cells were negligibly small (Figure 7, A and B) in contrast to currents of WT TRPC6– (Figure 7, C and D) or TRPC6 L780P–expressing cells (Figure 7, E and F). Statistical analysis shows that the DOG current amplitudes are smaller than carbachol-induced amplitudes; however, the WT/mutant differences are statistically significant (Figure 7G). Electrophysiologic characterization revealed currents mediated by TRPC6 G757D. Whole-cell currents were recorded in transfected HEK293 cells using the protocol described in Concise Methods. After obtaining whole-cell configuration, currents during voltage ramps from −100 to +100 mV were recorded. (A, C, and E) Inward currents at −60 mV were plotted over time. (B, D, and F) Current-voltage relationships obtained during voltage ramps from −100 to +100 mV: 1, basal currents (grey); 2, 100 μM carbachol (Cch) -induced currents (red); and 3, 100 μM Cch-induced currents in the presence of 100 μM gadolinium chloride (Gd3+, black). (A and B) Background currents were measured in YFP (control) –transfected cells. (C and D) TRPC6-mediated currents were recorded in WT TRPC6–expressing cells. (E and F) TRPC6 G757D currents were recorded in TRPC6 G757D–transfected cells. (G) Statistical analysis of the currents (plotted as current density at −60 mV). Data are means±SEMs of seven cells in each group. *P≤0.05; **P≤0.01. (H) Surface biotinylation of HEK293 expressing WT TRPC6 and TRPC6 G757D C-terminally fused to YFP was performed as described in Concise Methods. Shortly, the incubation in the presence of the biotinylation reagent EZ-Link-Sulfo-NHS-LC-Biotin is followed by cell lysis and subsequent extraction of the biotinylated protein using avidin beads. The proteins were analyzed by immunoblot using an anti-GFP antibody for visualization of TRPC6 in the lysates (Lys) and biotinylated (Biotin) TRPC6 in the avidin bead extracts. Shown is a representative experiment of nine experiments, and the values of statistical analyses are given below. Electrophysiologic characterization revealed currents mediated by TRPC6 L780P. Whole-cell currents were recorded in transfected HEK293 cells using the protocol described in Concise Methods. After obtaining whole-cell configuration, currents during voltage ramps from −100 to +100 mV were recorded. (A, C, and E) Inward currents at −60 mV were plotted over time. (B, D, and F) Current-voltage relationships obtained during voltage ramps from −100 to +100 mV: 1, basal currents (grey); 2, 100 μM DOG-induced currents (red); and 3, 100 μM DOG-induced currents in the presence of 100 μM gadolinium chloride (Gd3+, black). (A and B) Background currents were measured in YFP (control) –transfected cells. (C and D) TRPC6-mediated currents were recorded in WT TRPC6–expressing cells. (E and F) TRPC6 L780P currents were recorded in TRPC6 L780P–transfected cells. (G) Statistical analysis of the currents (plotted as current density at −60 mV). Data are means±SEMs in each group: eight cells (YFP, grey), 12 cells (WT, black), and 13 cells (L780P, green). *P≤0.05; **P≤0.01. The CFP and YFP fusion constructs used above for the monitoring of equimolar expression enabled fluorescence resonance energy transfer (FRET) measurements.26 FRET as a measure of the vicinity between two proteins showed comparable FRET efficacies of the TRPC6 WT/WT and TRPC6 WT/G757D, arguing for the comparable ability of TRPC6 G757D to form channel complexes with TRPC6 WT (Supplemental Figure 1B). Other diacylglycerol analogs were tested, and the results excluded compound-specific artifacts (Supplemental Figure 2). Lastly, we studied plasma membrane localization by biotinylation approaches. The data show surface expressions of TRPC6 WT and TRPC6 G757, which are indistinguishable from each other (Figure 6H). The results indicate that G757D exhibits dominant negative effects without changing its surface localization. Our approach of studying the molecular basis of FSGS-related changes in TRPC6 sequence revealed deeper insight into the cause of G757D-mediated changes of TRPC6 activity. Our 3D model, generated on information of related ion channel structures, shows that the amino acid G757 is located at an interface of the homotetrameric channel complex. Both the size and the additional charge introduced by the G757D mutation cause an opening of the channel complex, which may underlie a changed TRPC6 activity. The model mutations generated for testing our hypothesis showed activities below the activation level of WT TRPC6, ultimately arguing for an LOF phenotype, which was surprising to us, because FSGS–related TRPC6 mutations have been described so far as GOF mutations.6,7,16,20,22 In a subsequent analysis of all available FSGS–related TRPC6 mutations, we confirmed the known GOF phenotype of a number of pathogenic sequence variants.6,7,16,20,22 However, G757D as well as four other mutations were identified as LOF mutations. 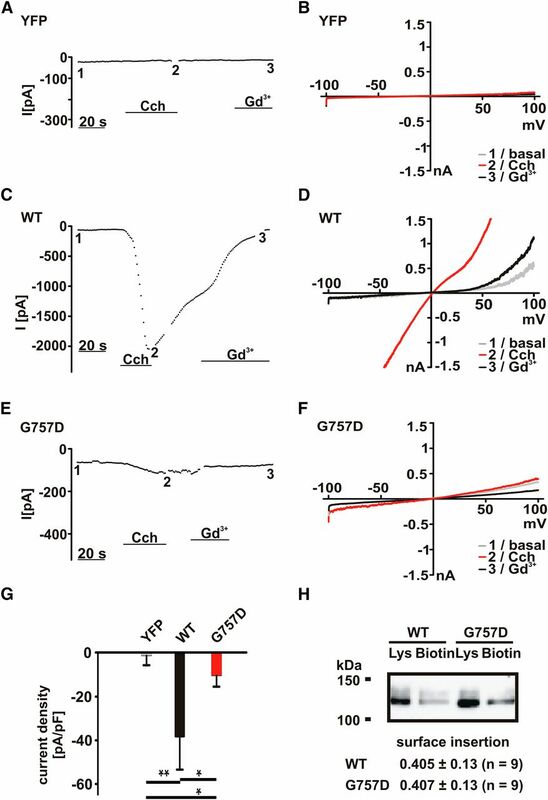 The reduced activity of TRPC6 G757D revealed by Ca2+ imaging experiments and electrophysiologic recordings is caused by neither deficits in plasma membrane insertion of the channel complex nor a ligand-specific effect. The dominant negative character of TRPC6 G757D makes it likely that the LOF character is the direct cause of FSGS in the affected patients. The effect of TRPC6 on the pathophysiology of human podocytes has been elucidated by two independent publications reporting the identification and characterization of TRPC6 P112Q, N143S, S270T, K874*, R895C, and E897K mutations linked to familial FSGS.6,7 Functional characterization of TRPC6 P112Q, R895C, and E897K in recombinant expression systems indicated that replacement of these amino acids causes increased TRPC6 activity, providing the basis for linking TRPC6 GOF mutations to familial FSGS. In the meantime, three additional mutations, TRPC6 M132T,16 Q889K,20 and R175Q,17 have been revealed as GOF mutations to cause human FSGS. We used these mutations for validation of our TRPC6 3D model and expression systems. By doing this, we were able to classify the recently published TRPC6 G109S,15 N110H,14 H218L,22 and A404V19 mutations as GOF mutants. There is obvious diversity in the GOF phenotype of these mutants, because our studies revealed differences between the effects of the mutations on basal versus stimulated Ca2+ influx. In contrast, expression of TRPC6 N125S,15 L395A,19 G757D,21 L780P,15 and R895L22 resulted in reduced channel basal activity, suggesting an LOF phenotype of these mutants. Direct channel activation by the use of a diacylglycerol derivative, DOG, confirmed the LOF phenotype of these mutants. TRPC6 N125S, L395A, G757D, L780P, and R895L exhibited a significant and marked reduction of calcium entry compared with WT TRPC6. Of note, genotype-phenotype analysis shows a remarkably early onset of SRNS/FSGS in patients with the LOF mutations N125S, L395A, G757D, L780P, and R895L. In particular, index patient 1 and his father, both carrying G757D, presented with the kidney disease within the first year of life and early infancy, respectively. The patient carrying L780P presented with SRNS at age of 7 years old,15 whereas the patient with L395A suffered from SRNS since the age of 2.4 years.19 Of note, the majority of reported patients with TRPC6 GOF mutations presented in adolescence or early adulthood, with a mean age of 20 years old (range = 8–57 years old). These results also highlight the effect of TRPC6 mutations in childhood proteinuric kidney disease. The multimeric structure of TRP channel complexes has received considerable attention since the discovery of this channel superfamily. The structures obtained from electron cryomicroscopy of TRPV1, TRPV2, and TRPM2 argue for a tetrameric structure.23–25 The question of whether TRP channels form homo- or heterotetrameric complexes is still a matter of debate. Within the TRPC family, formation of heteromultimeric complexes within the confines of TRPC subfamilies has been shown.26,31 TRPV5 and TRPV6 can form heteromultimers, whereas all other members of TRPV family form homomultimeric channels.32 The formation of a channel complex beyond constraints of phylogenetic vicinity was shown for polycystin channel complexes composed by TRPP2 and TRPV4.33–36 Our new 3D, tetrameric TRPC6 in silico model enabled us to obtain new insights into the structure of TRPC6. On the basis of this model, we deduced that the exchange of glycine 757 by aspartate results in a collision with isoleucine 812 and a local steric hindrance. Our experimental approach revealed that a cytosolic localized TRPC6-TRPC6 interaction controls overall channel activity. In summary, our data unravel the molecular TRPC6 mechanisms involved in hereditary FSGS and provide a model of steric hindrance explaining the LOF phenotype of TRPC6 G757D. 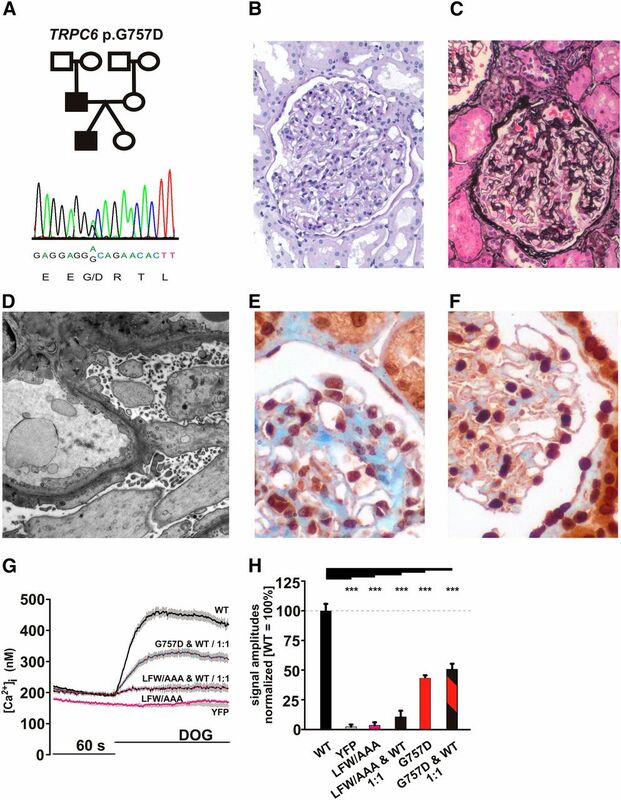 Loss of TRPC6 function might be implicated in the pathophysiology of juvenile forms of hereditary FSGS and may allow stratification of pathogenic TRPC6 variants underlying proteinuric kidney disease in humans. To generate the 3D model, our homology modeling pipeline starts with a BLAST search for one or more template structures. Therefore, a position–specific iterated BLAST search was performed.37 By this search, standard parameters provided by the Bioinformatics Toolkit of the Max Planck Institute for Developmental Biology of the University of Tübingen were applied with one limitation to the RCSB Protein Data Bank (PDB).38 This search resulted in a number of highly similar structures with a significant low e-value. Most of the structures identified are part of the ankyrin domain of TRPC6. By this, we decided to use the PDB structures 1N11, 1NW1, 3UI2, 4DXW, 4F4L, and 4F6R, whereby only those parts of the structures were used featuring a high structural similarity. Therefore, we used block as the sequence alignment type, such that amino acids will be preferentially aligned in a row, resulting in an improved representation of the model. These parts were combined by a minimal overlap of at least five amino acids to carry out the secondary structure for the ankyrin domain. On the basis of other described homology models of TRPV1,25 we additionally used the template structure of Kv1.2 (PDB:2R9R) for modeling the transmembrane and C-terminal region. The alignments for the transmembrane helices were optimized by hand for the most suitable modeling of these regions. Information of the positions of the transmembrane helices was applied by Uniprot knowledge base.39 The last template structure that was applied to build the model was the human thymidylate kinase (PDB:1Q43) to model the N-end domain of the N terminus. To combine all of these parts to an overall model, MODELER, version 9.2 was used.40 The complete homology modeling process was performed by self–defined Python scripts, for which all atom types, except water molecules, were considered. As the main parameter of MODELER, we applied the automodel option to create the model. To create a tetrameric structure of TRPC6, the cryo-EM structure of TRPV1 was applied as the template. The resulting homology model was checked and cleaned with respect to structural disorders, protein residue connectivity, and bond orders as well as missing side chains and backbone atoms. For this, Discovery Studio 4.1 was used (Discovery Studio; Accelrys Inc.; http://www.accelrys.com/dstudio). As an additional step, an energy optimization (conjugate gradient) step was carried out to clean up ψ/ϕ-angles. Plasmid DNA coding for TRPC6 C-terminally fused to YFPs was used as the template to generate the TRPC6 mutants identified by others and us.27 For site-directed mutagenesis, the TRPC6-YFP expression plasmid was amplified by oligonucleotides (custom made by Biomers, Ulm, Germany) harboring the sequences coding for the planned mutation (Supplemental Table 1). Amplification was performed using Phusion DNA Polymerase (Biozym, Hess. Oldendorf, Germany) using the temperature time protocol 98°C for 30 seconds, 98°C for 10 seconds and 71°C for 420 seconds 18 times, and 72°C for 600 seconds. Template DNA was removed by digestion using DpnI, and amplified DNA was used for the transformation of high efficiency–competent Escherichia coli NEB 5α (New England Biolabs, Ipswich, MA). Plasmid DNAs from several clones were isolated and sequenced. For transfection, large–scale DNA preparations were performed using Nucleobond Xtra Maxi Kits (Macherey-Nagel, Dueren, Germany). HEK293 cells were grown in minimal essential medium supplemented with Earl salts (PAA, Pasching, Austria), 10% FCS (PAA), 4 mM l-glutamine (PAA), 100 U/ml penicillin (PAA), and 100 μg/ml streptomycin (PAA) in the presence of 5% CO2 at 37°C. For the experiments, the cells were plated in 35-mm dishes and placed onto glass coverslips. One to two days after seeding, the cells were transfected with 2 μg plasmid DNA coding for WT or mutant TRPC6 C-terminally fused to fluorescent proteins using calcium phosphate. The transfection mixture contains 2 μg DNA; 112 μl H2O; 125 μl 2× BBS buffer containing 50 mM BES, 280 mM NaCl, and 1.5 mM Na2HPO4; and 12.5 μl CaCl2 (2.5 M). The medium was exchanged after 5–6 hours, and the cells were used for experiments 20–48 hours post-transfection. For the cotransfection experiments, cells were transfected with 3 μg mixture of plasmid DNAs coding for WT TRPC6 C-terminally fused to CFPs and the WT or mutant TRPC6 fused to YFPs using calcium phosphate. The individual mixtures enabling 1:1 expression of CFP- as well as YFP-fused protein were experimentally determined. The relative CFP and YFP fluorescence intensities of individual DNA mixtures were determined using the FRET setup (see below). We recorded the fluorescence intensities of CFP as well as YFP by measuring 30 cycles with 20-milliseconds per cycle exposures at 410 nm for CFP detection and 20-milliseconds per cycle exposures at 515 nm for YFP. The obtained fluorescence intensities were normalized on the basis of fluorescence intensities obtained from cells expressing an intramolecularly fused CFP-YFP tandem protein.32 This approach allowed us to assess the molar ratio between CFP– and YFP–fused TRPC6 channels of the different transfection mixtures and enabled us to identify a mixture of plasmid DNA reproducibly enabling the expression of equimolar amounts of both channel proteins as a basis for the validity of the coexpression experiments. [Ca2+]i measurements in single cells were carried out using the fluorescence indicator fura-2-AM combined with a monochromator–based imaging system (T.I.L.L. Photonics; FEI, Gräfeling, Germany) attached to an inverted microscope (Axiovert 100; Carl Zeiss GmbH, Jena, Germany). Cells were loaded with 2 μM fura-2-AM (Biomol [Enzo Life Sciences], Farmingdale, NY) for 30 minutes at 37°C in a standard solution composed of 138 mM NaCl, 6 mM KCl, 1 mM MgCl2, 2.5 mM CaCl2, 5.5 mM glucose, and 10 mM HEPES (adjusted to pH 7.4 with NaOH). After washing and exchange of solutions to remove excessive extracellular fura-2-AM, fluorescence emission at 510 nm was recorded of cells excited at 340 and 380 nm. TRPC6 activity was routinely measured in response to carbachol, which stimulates endogenously expressed muscarinic acetylcholine receptors in HEK293 cells. Receptor activation of the cells by carbachol is known to cause activation of phospholipase C and subsequent breakdown of phosphatidylinositol-4,5-bisphosphate generating inositoltrisphosphate and diacylglycerol, the activating intracellular ligand of TRPC6 channels.10 This approach was useful in particular for the characterization of the GOF mutants, showing an increased activity compared with TRPC6. 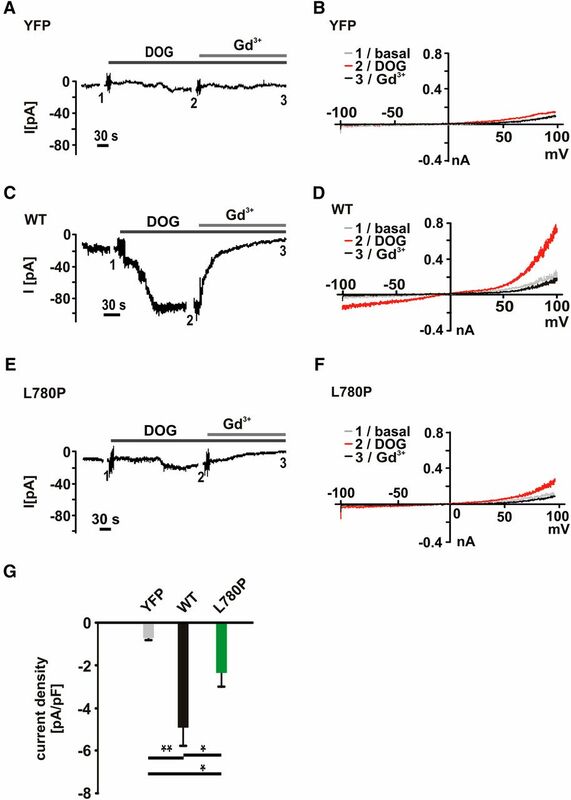 However, all other mutants showing comparable and lower activity than WT TRPC6 were characterized in additional experiments using DOG, a diacylglycerol analog and direct activator of TRPC6. Although carbachol stimulation of YFP (control) –transfected HEK293 cells resulted in high intracellular calcium concentrations because of calcium release from intracellular stores by inositoltrisphosphate and other endogenous entry mechanisms (producing a high background signal corresponding to an inappropriate signal-to-noise ratio; e.g., the stimulus of choice to characterize effects above the WT TRPC6 level), change in intracellular calcium concentration is negligible in YFP (control) –transfected HEK293 cells on DOG stimulation (low background signal corresponding to an optimal signal-to-noise ratio for LOF measurements; e.g., the stimulus of choice to characterize the activity of TRPC6 mutants in between baseline and WT TRPC6 activity). After correction for background fluorescence, the fluorescence ratio F340/F380 was calculated. In all experiments, we identified transfected cells within the whole field of vision by their YFP fluorescence at an excitation wavelength of 480 nm. For normalization of expression levels during analyses, the relative fluorescence intensity values were used. Therefore, only cells within a distinct range of relative fluorescence intensity were marked as the region of interest. Experiments with at least 20 cells were summarized and are given as the number of experiments for each experimental condition. Plasmid–encoding TRPC6 channels C-terminally fused to either CFP or YFP as described above were used in cotransfection experiments for subsequent measurements of FRET. For optimal signal in the FRET experiments, the mixtures were adjusted to enable the expression of both proteins in a ratio of 1:2 (CFP:YFP) to minimize the probability of CFP-only multimers. The optimal plasmid DNA mixture of these cotransfection experiments was determined as described above. The FRET efficiency was obtained by measuring the increase in CFP fluorescence on photobleaching of the acceptor fluorophor. The measurements of FRET were carried out using the monochromator–based imaging system (described above) additionally equipped with a dual band–pass dichroic mirror and an emission filter wheel (Lambda 10–2; Sutter Instruments, Novato, CA) included in the emission path (objective: Plan-Apochromat 63×/1.4 NA; Carl Zeiss GmbH). The photobleaching protocol consisted of 15 cycles with 10-milliseconds per cycle exposures at 410 nm for CFP detection and 8-milliseconds per cycle exposures at 515 nm for YFP detection.32 During the following 60 cycles, YFP was photobleached by applying an additional 2-seconds per cycle illumination at 512 nm. FRET efficiencies were quantified by increase of CFP (donor) fluorescence after selective bleach of a potential acceptor, YFP. Standard whole–cell recordings were performed using an EPC10 Amplifier under control of Patchmaster software (HEKA, Lambrecht, Germany) or an EPC7 Amplifier under control of Clampex software (Molecular Devices, Sunnyvale, CA) at room temperature. Pipettes were made from borosilicate glass capillary tubes and had resistances of 4 to 9 MΩ. Time courses of inward currents at a holding potential of − 60 mV were recorded from transfected HEK293 cells during extracellular application of carbachol in the absence or presence of gadolinium chloride (each was 100 μM). Voltage ramps were obtained from −100 to +100 mV (1400-millisecond duration). A perfusion system was used to exchange extracellular solutions, with complete solution exchange achieved in 4–5 seconds. Pipettes for whole-cell recordings were filled with a solution of 130 mM CsCH3O3S, 10 mM CsCl, 2 mM MgCl2, 3 mM Na2ATP, and 10 mM HEPES (pH 7.2 with CsOH). The standard bath solution was composed of 135 mM NaCl, 5 mM KCl, 2 mM CaCl2, 1 mM MgCl2, 10 mM glucose, and 10 mM HEPES (pH 7.4 with NaOH). Transfected HEK293 cells with 95% confluence grown in dishes (94 mm) were washed 40–48 hours after transfection with ice-cold PBS. Subsequently, the cells were treated with EZ-Link-Sulfo-NHS-LC-Biotin (0.5 mg/ml; Thermo, Rockford, IL) and then lysed in ice-cold PBS (pH 7.4) containing 1% Triton, 1 mM EDTA, 1% SDS, and protease inhibitor cocktail (Sigma-Aldrich, St. Louis, MO). The lysates were sonicated and agitated at 4°C for 15 minutes. Cellular debris was removed by centrifugation for 10 minutes at 1000×g and 4°C. The amount of protein (2000 μg) for purification was normalized to the lowest signal of GFP-tagged TRPC6 in Western blots of total cell lysates. The proteins were added to 550 μl avidin-agarose beads (Thermo) pre-equilibrated in PBS and then incubated at 4°C for 2 hours. The biotin-avidin complexes were then harvested by centrifugation for 2 minutes at 4°C and 200×g and washed four times with lysis buffer supplemented with 0.25 M NaCl. The beads were then resuspended in 160 μl 2× Protein Loading Dye (Roth, Karlsruhe, Germany) supplemented with 25 mM dithiothreitol and incubated at 50°C for 30 minutes. The beads were removed by centrifugation for 2 minutes at 1000×g. Proteins were fractionated by SDS-PAGE (6% acrylamide) and transferred onto nitrocellulose membranes (Protran Nitrocellulose Transfer Membrane; Whatman, Dassel, Germany). The proteins were visualized by an anti-GFP antiserum (Roche, Basel, Switzerland) using the ECL Chemiluminescence System (GE Healthcare, Waukesha, WI) or the SuperSignal West Femto Chemiluminescent Substrate (Thermo) according to the manufacturers’ instructions. Chemiluminescence signals were analyzed and quantified using the VersaDoc 4000 MP Imaging System (Bio-Rad, Hercules, CA). To enable comparability of the experiments, the values were normalized to TRPC6 WT signals. Data on patient and data recruitment are published elsewhere.28,21 The study was approved by the Ethics Committee of the University Duisburg-Essen (09–3954/24.03.09). Patients were entered into the study after having given written informed consent. Immunostaining was carried out on 4-μm-thick sections from paraffin-embedded biopsies. Antigen retrieval was performed with 0.01 M citrate buffer at pH 6.0 for 25 minutes in a hot water bath (95°C). The primary antibody (rabbit polyclonal anti–TRPC6 antibody; ab6330; Abcam, Inc., Cambridge, MA) was incubated for 60 minutes, and antibodies were shown with a commercially available antibody anti–rabbit IgG detection kit (ZytoChem-Plus HRP Polymer-Kit; Zytomed Systems, Berlin, Germany). Sections were counterstained with Mayer Hemalum Solution (Merck GmbH, Darmstadt, Germany). Sections were coverslipped and examined with a Zeiss Axio Imager equipped with an AxioCam MRC Camera (Carl Zeiss GmbH). Tissue was fixed in 1% glutaraldehyde, postfixed with 1% osmium in 0.1 M sodium-cacodylate buffer, dehydrated, and embedded in epoxy resin (Serva, Heidelberg, Germany). Ultrathin sections were cut (ultramicrotome; Reichert-Jung) and contrasted with 1% uranyl acetate in methanol followed by lead citrate. Micrographs were generated with a transmission electron microscope (LEO 912; Carl Zeiss GmbH). Carbachol (Sigma-Aldrich) was diluted from aqueous 100 mM stock solutions. DOG, 1,2-didecanoyl-sn-glycerol, 1,2-dilauroyl-sn-glycerol, and 1-stearoyl-2-arachidonoyl-sn-glycerol were obtained from Avanti Polar Lipids (Alabaster, AL) and diluted from 50 mM stock solutions in DMSO. Measured values are presented as means±SEMs. In addition to Microsoft Office Excel (Microsoft, Redmond, WA), Origin (version 6.0) and CorelDrawX4 were used for statistical analyses and creation of the graphs. For statistical analyses of differences, an unpaired t test was used. The signal intensities were calculated as differences between baseline and peak and normalized to WT TRPC6. For calculating of the areas under the curve, the curve was integrated from the beginning of application until the end of measurement without the baseline part. The authors thank Christine Piesch, Mengxue Zhang, and Yoland-Marie Anistan for excellent technical help and Claudia Mischung and Sylvia Bähring for advice. We also thank the Medical Research Council– and Wellcome Trust–funded Human Developmental Biology Resource at the University College London Institute of Child Health for supplying anonymized, ethically approved fetal tissues. The Deutsche Forschungsgemeinschaft supported our studies. This article contains supplemental material online at http://jasn.asnjournals.org/lookup/suppl/doi:10.1681/ASN.2015030318/-/DCSupplemental.